About: Located within walking distance of Paddington Station, Cheminee serve a variety of authentic Persian dishes at their restaurant. This small, cosy restaurant was full the Monday night we visited, and as we waited for a table one guy told us he got takeaway from here once a week, and a woman told us the food was superb and it was her third visit. The food was delicious and very authentic, rich salad olivieh, very tasty chargrilled kebabs, heaps of saffron rice and the smell of bread from the oven. Will go again. I love this little restaurant. 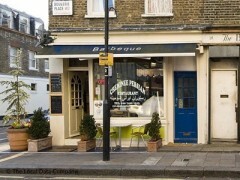 It's very reasonably priced esp for london, the food is honest, unpretentious. Less than ten mins walk from paddington station I always eat here if I'm travelling to london. My housemates and I are regular visitors to Cheminee reastaurant as we live locally. It's always our first choice for a place to go if we're feeling lazy and have decided not to cook. Yes, the owners have changed but the staff and food have remained the same. Delicious grilled lamb, baby chicken on the bone, various stews and starters. The bread is gorgeous and the rice a satisfying alternative. The previous reviewer seems to have had a bad experience on their last visit, I hope they give it another go. The prices have gone up but a lunch time take away chicken or lamb 'sandwich' generously filled served wrapped in bread with salad only costs £4.00, I think it's £4.50 to eat in. With regard to the music played, it always seems to be easy listening radio. Overall, Cheminee is a cheerful little place with good food. Our previous visit, in 2008, was very successful, with authentic Persian staff, food, music, and atmosphere. However, our recent visit, on 17 April 2009, was very disappointing. The staff had changed from Iranians to Malaysians, the food was without character, and the music was bland American pop songs. We would endorse the favourable reviews posted for 2008 but would advise that they bear no relation to the present situation. A lovely experience! Delicious, fresh and affordable food. Friendly staff and , although small, the restaurant was intimate, clean and very welcoming.Well worth a visit as an introduction to Iranian cuisine. I have eaten here for years. Being a small restaurant, the food is very good quality, the atmosphere intimate and the staff helpful and friendly. The location is also nice and quiet, being in a residential area of Bayswater. The food in La Cheminee was very nice but my experience of this restaurant was marred by the theft of my handbag on the evening of 31st July 2008 and the response to the incident by the restaurant. The restaurant representative was less than helpful, did not offer to call the police, did not offer to search the restaurant or out back and I was told the cc tv cameras (there were two) were not working. Noone made a note of my name. The day time staff the following day were much more sympatheic and at least took my name. I would like to warn other visitors of the theft in the hope that people will be vigilant and to avoid it happening to someone else. In case it has happened to anyone else reading this, the crime was reported to Paddington Green police station.